Organisations are increasingly realising they can’t be reactive when it comes to misconduct and unethical behaviour. Whether issues have surfaced, regulation is dictating it, or they are planning ahead, more organisations are taking action. They are now providing the ability for employees, stakeholders, and customers to anonymously report misconduct through their whistleblower program. As you explore putting a whistleblower program in place, it’s important to ask the right questions. In this article, we have outlined 7 questions you should ask yourself as you start planning your program. What do you want the whistleblower's journey to be? How do I make a report? Where do I go, what do I say, and how do I submit it? Will my organisation know it’s me making the report? Will my organisation try to identify me and how can I ensure I stay anonymous? If they identify me, will they retaliate in any way? What happens after I make my report? What protections do I have after I submit a report? By thinking like a whistleblower, you design your program so the answers to these questions are very clear. Your ultimate goal is to increase reporting to identify risk and take action. If it's difficult or not clear to employees how to submit a report, they will not make the effort. How do you make your whistleblower program truly anonymous? Sometimes what an organisation thinks is "anonymous" is not viewed the same way by its employees. A phone hotline is a great example where employees might worry their voice will identify them. This can be due to an accent, how they speak, or in smaller organisations, their actual voice. Phone hotlines also don’t let informants send across any documents, photos, or other evidence. This makes it difficult to progress investigations as an informant is unlikely to call back. An anonymous whistleblower platform should enable 2-way communication that will not reveal the informant's identity. Web-based whistleblower platforms provide this anonymity and informants can submit a report on a computer or mobile device. Web-based whistleblower platforms also have tools like QR codes which help make submitting reports easier. It’s also important to use tools employees are familiar with like the web, mobile, live chat, or SMS. Employees from Gen Y and Gen Z do not use the phone like prior generations. They are mobile first and always on the web, so the tools you use to engage them must match their expectations. By providing different channels to reach you, they can use the one they are most comfortable with which will increase the number of reports you receive. What questions do you need to ask whistleblowers? The questions you ask directly impact the experience of the whistleblower. If you make it hard by having long questionnaires, making all questions mandatory, and asking for information that might identify the informant, they will drop out and not report. Focus on the information you need to understand the case and what has happened. Treat the submission as the start of the conversation and use the initial report as a way to start building trust with the informant. Also, don’t ask every conceivable question up-front in your questionnaire. When you have anonymous, 2-way communication, you can come back to the informant and ask additional questions. Also, think about what type of questions you are going to ask. Multiple choice questions are easier to answer but also are not as flexible in gathering exact information. Free-write questions allow for more precision but are also harder for informants to write out. Think first about the format of the information you need and then match this with the right question type. And always think about this from the whistleblower's perspective so you make it easy for them to submit reports. How will you communicate with whistleblowers? How you communicate with informants plays a huge role in the experience they go through. It's important that each case is not handled in an ad hoc way and you have a process for how you engage with them. This includes how you initially respond, how to ask questions, as well as how to best have a 2-way conversation. Submitting a report is a stressful affair, so the case manager needs to communicate with the informant in a thoughtful and engaging way. Instead of leaving this to chance, think about the workflow and communication style you want case managers to have with informants. While they need the flexibility to investigate each case, you also want them adhering to standard processes as they approach each case. Also think about how you can use automations to adhere to your processes and ensure specific steps always happen. Do you need to engage with any 3rd parties consulting firms? Expertise: Setting up a whistleblower program is new for many organisations. Many use the expertise 3rd parties have in setting up programs, training staff, and investigating reports. Bandwidth: Many organisations don't have the bandwidth to set up, manage, and run their whistleblower program. They prefer to outsource the investigations or the entire program to a 3rd party. Independence: 3rd parties provide independence in investigations you can't achieve doing them in-house. This can be valuable for sensitive and important reports, as well as protecting an informant’s anonymity. How do you roll out and communicate your whistleblower program? 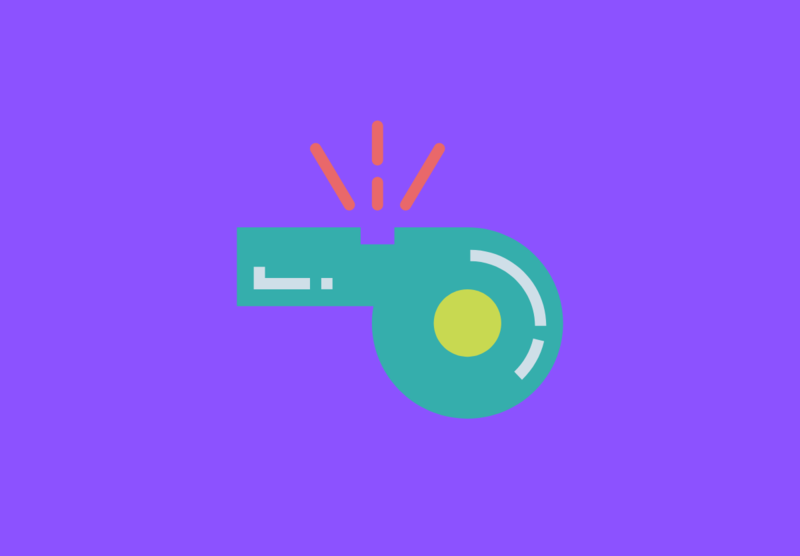 A whistleblower program only yields value if employees know about it and how to submit reports. This is the point when many programs fall down. They don't communicate why they have put a program in place, how employees can submit reports, and what happens once they submit a report. Organisations often send out one email and then bury the link on an intranet or external website. Best-in-class organisations focus on communicating the entire journey. This includes the strategy of why the program is being set up, where employees access it, how to submit reports, and what happens next. They also know they need to consistently reinforce the message. After the first wave of educating employees about the program, they consistently remind them about it. It's also built into the new employee induction training, employee intranet, and other communication tools. This communication can be emails, posters in the office, reminders during meetings, and managers reinforcing the message. Consistent and clear communication is crucial to ensure employees know about the program, why you are doing it, and know how to make a report. Organisations should also encourage “courageous conversations”. Reinforce that it’s okay if reports are found out to be wrong as long as they are genuine and not malicious. A great analogy is that a whistleblowing platform is like a smoke alarm. It sometimes might go off when there isn’t a fire, but you want it there for when a fire happens. How do you measure the success of your whistleblower program? A target date for your program to launch. Dates by when case managers have received training. Milestones for communicating the program to your employees and stakeholders. How fast you respond to informants after they submit a report. How fast you assign case managers to a report and they begin working the case. You do not want to set metrics for some areas as they can create unintended consequences. Examples include the number of reports you receive each year as well as setting a metric for the length of an investigation. Employees know that it exists (and it proactively communicated and reinforced). It is clear and easy for them to submit reports. Informants understand they can submit reports anonymously and their identity is protected. There is 2-way, anonymous communication throughout the process. Reports are taken seriously, investigated, and the organisation takes steps to fix problems and change policies based on the results of the investigations. Answering these 7 questions at the beginning will help you better plan your whistleblower program. Making it easy and giving employees the confidence to report will help you identify risk fast and address any blind spots in your organisation.